ffffff ANSI C78.377-2008 is a standard developed by the American National Standards Institute (ANSI), the American National Standard Lighting Group (ANSLG), and the National Electrical Manufacturers Association (NEMA) in 2008 to standardize the description of tints in LEDs and Solid State Lighting. 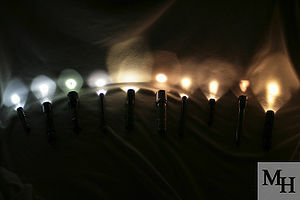 It is based on a similar standard developed for fluorescent lighting. It sets up 8 points with coordinates based on correlated color temperature (CCT), and offsets from each coordinate that describe quadrangles on the chromaticity chart as shown in the graphic to the right. This standard was adopted by Cree (as well as most others, to some degree) to describe the tint of their LED products. Cree numbered the quadrangles 1 through 8 starting with 6500K. They developed the concept further by dividing each ANSI quadrangle into four quadrants to get bins like 1A, 1B, 1C, and 1D being divisions of quadrangle 1 (6500K). Towards the cold end of the spectrum a non-ANSI quadrangle, quadrangle 0, was added. Tints lying outside of the ANSI standard, above and below quadrangles 0, 1, 2, 3, 4, and part of 5, are given names like 1R, 1S, 1T, and 1U. Cree subdivides regions 5, 6, 7, and 8 into even smaller subdivisions to get bins like 5A1, 5A2, 5A3, and 5A4. This gives a total of 16 different bins in one ANSI quadrangle. In the graphic below, the ANSI quadrangles are in red with the Cree bins overlaid on them (click for a larger version). Luminus does something similar by subdividing the standard ANSI quadrangles and adding their own outside of those limits. 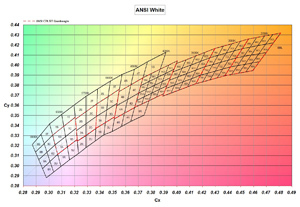 Nichia, Samsung, and Osramalso use ANSI's scheme for at least some of their LEDs.